DETROIT -- General Motors Vice Chairman Steve Girsky says Opel is not for sale. "We're developing plans to make Opel work," he said at the Automotive News World Congress here on Tuesday. Opel and PSA/Peugeot-Citroen were mentioned as possible targets of Fiat-Chrysler CEO Sergio Marchionne, who said on Monday he may seek to combine his company with another automaker to increase efficiencies and cut development costs. Marchionne made a run at Opel in 2009 but pulled out of the bidding. GM decided in late 2009 to keep Opel and UK-based sister brand Vauxhall rather than sell them to supplier Magna International Inc.
An Italian newspaper reported on Tuesday that PSA, Europe's second-largest carmaker after Volkswagen, is ready to discuss a possible alliance with Fiat. Marchionne denied that any partnership discussions have taken place with PSA. In November 2011, GM CEO Dan Akerson made Girsky chairman of Opel's supervisory board, handing him the assignment of reviving a unit that has lost roughly $13 billion since 1999. GM in November reversed an earlier prediction that its European operations would break even in 2011 for the first time in many years because of the sagging economy. "We're committed to returning our European business to sustained profitability," Girsky told the Congress. "We need to be prepared for a challenging demand environment for the foreseeable future." 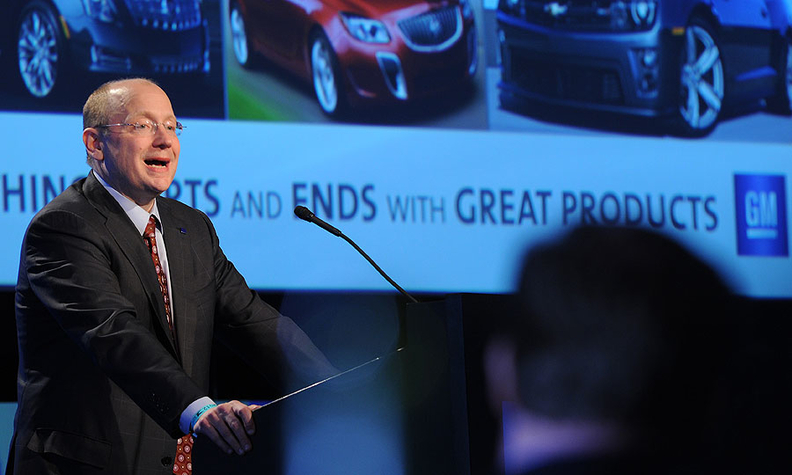 Also in his speech, Girsky, a former Wall Street analyst, said it will take four or five more months before it's clear whether U.S. sales of GM's Chevrolet Volt plug-in hybrid will take off. "I think it'll be May or June before we know whether this thing really has legs," Girsky said. GM sold 7,671 Volts in the United States in 2011, short of its 10,000-unit target. Sales were hit by a federal investigation of fires that occurred after Volt crashes. GM says it has found a fix for the problem, but executives at the auto show here this week have downplayed expectations for 2012 Volt sales. Asked whether GM is sticking by its previously declared production target of 60,000 Volts this year -- 45,000 of which would be allocated to the United States -- both CEO Dan Akerson and Mark Reuss, president of North America, said the automaker will make enough to satisfy demand. Opel/Vauxhall will begin deliveries of the Volt-based Ampera in February. Opel said that the Ampera has been enhanced to further reduce the potential of a battery fire days or weeks after a severe accident. Girsky said restrained availability continues to keep a lid on Volt sales. GM launched the car in seven key markets in late 2010, but didn't roll it out nationally until late last year. "There's still dealer orders that are getting filled, there's customers that are still getting out there," Girsky said. "I don't think the dealers are really pushing this car yet because most of them only have one or two." Nonetheless, the Volt is serving as a halo vehicle by drawing in a new breed of customers, Girsky said. He said the median income of Volt buyers is $175,000 and the car "is bringing more BMW customers to GM than Cadillac is." He added that his wife, mother and aunt each own a Volt. Girsky has been a GM vice chairman since 2010, initially in charge of corporate strategy and alliances. Last year, Akerson expanded Girsky's role by giving him oversight of product planning, purchasing and GM's OnStar telematics unit. GM's financial performance: "We know our margins are well below our peers," he said. "We still have work to do." Changing GM's culture: "I think it's evolving," Girsky said. "It's about putting up wins, whether it's product wins, … profitability wins, reducing costs in a certain area, taking down sacred cows," he said. "I think it feeds off itself." GM's relations with suppliers: Girsky, whose direct reports include GM purchasing chief Bob Socia, acknowledged that GM historically pressed suppliers for the lowest possible price, without much collaboration on technology. "Socia spends a lot of time," he said, "on 'What do we have to do to be a part of supplier relations, supplier innovations?' It's really a different model."